Introducing | Batten Sportswear | A Continuous Lean. Ten years ago, at age 30, Shinya Hasegawa moved to New York City to attend design school and learn how to make clothing. 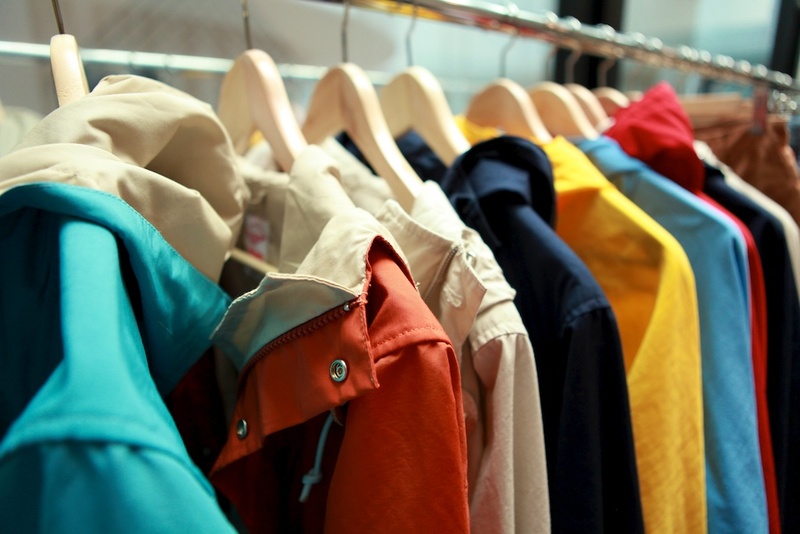 Growing up in Tokyo he was always had a fascination with clothing, often spending hours scouring for the best vintage and seeking out the best outdoor and workwear goods from America. 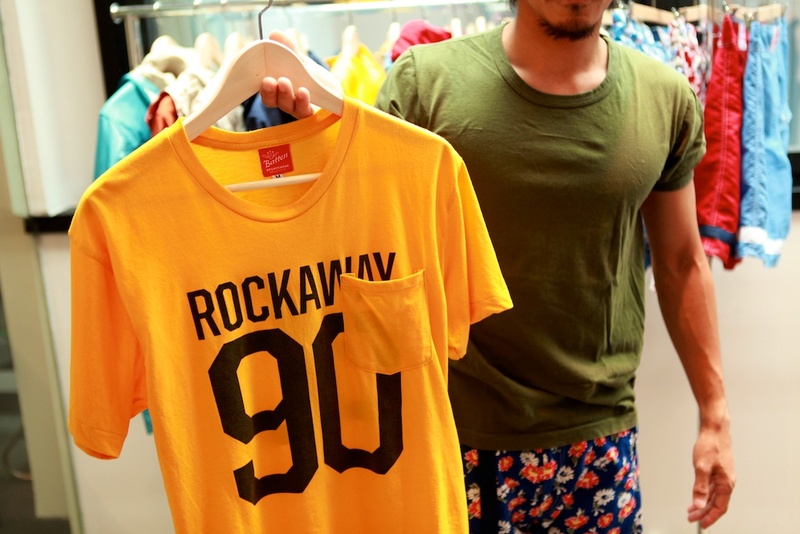 After earning his degree in New York, Shinya went to work for the vintage dealer What Comes Around Goes Around and then later spent four years working with Daiki Suzuki at Woolrich Woolen Mills. 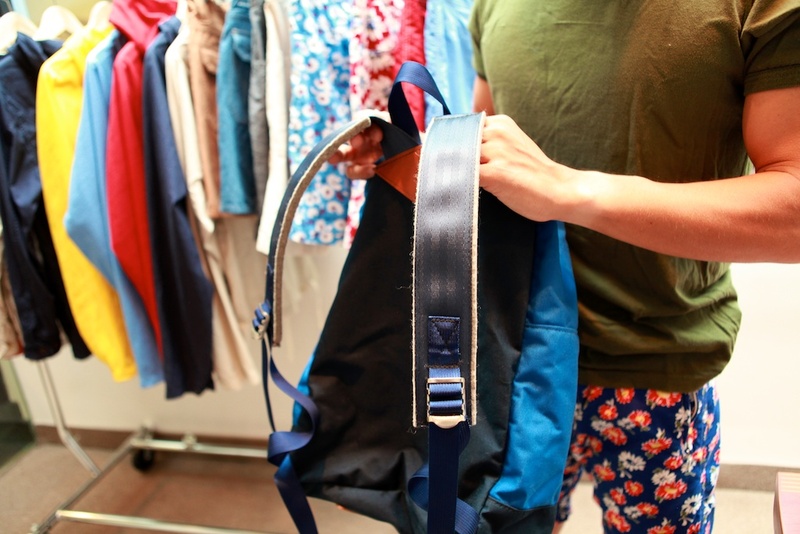 During his time in Tokyo and New York, Shinya’s love of clothing paralleled his love of surfing and the outdoors. This is where the inspiration for Batten Sportswear – a new line of mens outerwear, sportswear and accessories that is launching for spring / summer 2012 – was born. 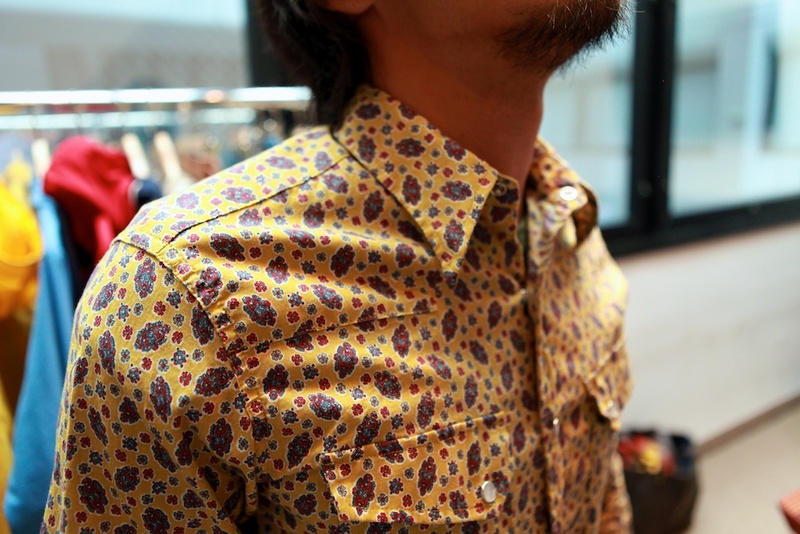 Seeing the collection with Shinya in his showroom, it was clear from the outset what the concept of the collection was. Batten mixes a weekend adventure in Yosemite with a subway trip to The Rockaways, all encircled by everyday life in the city. 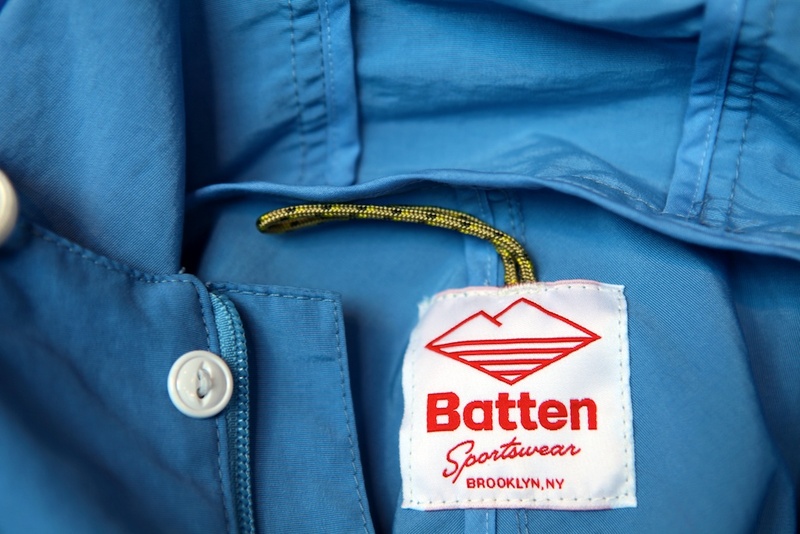 Batten Sportswear – which is entirely made in America – draws inspiration from vintage outdoor gear from the 1970s and 1980s, mixes in other elements from vintage American sportswear and adds in a dose of East Coast surf culture (something Shinya is passionate about, being an avid surfer). 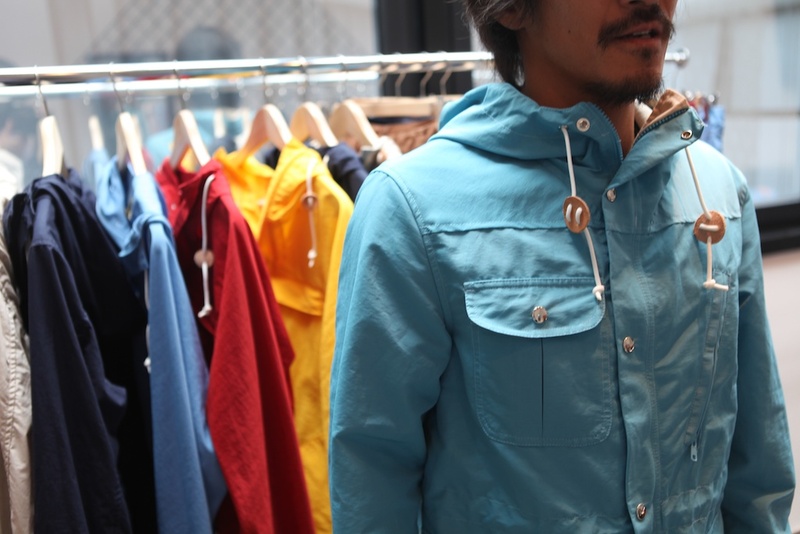 The collection ranges from jackets like the Travel Shell Parka, which is an update to the traditional 60/40. 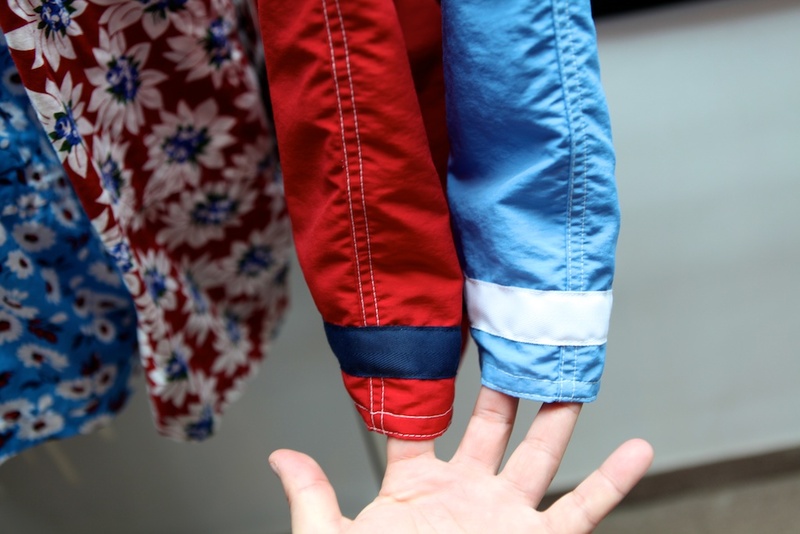 Shinya did things like change the sleeves to a two-panel design to slim them down and reduce the bulk of the original design. These design tweaks make the jackets more appropriate for use in the city as well as the outdoors, and just make them look better on. 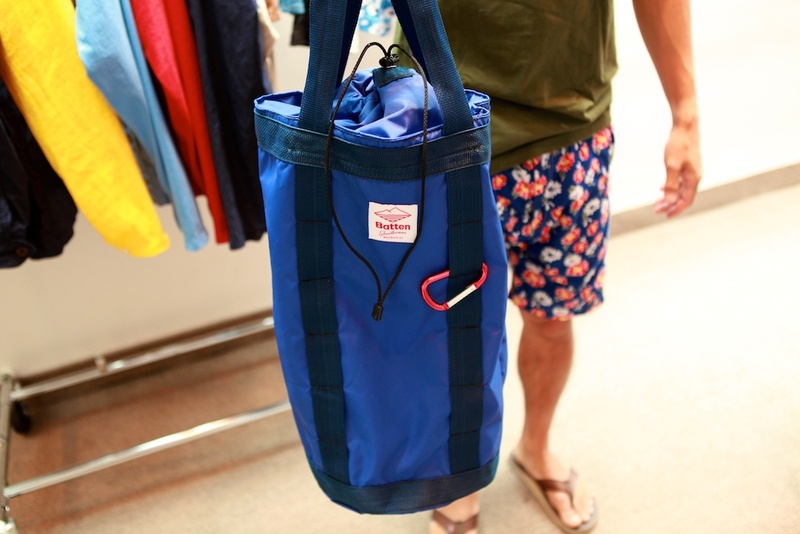 Other items in the collection, like the packable anorak, overhang shorts, beach bucket bag and the board shorts combine inspiration and needed functionality of outdoor clothing with more city-centric stylish twists. nice colours not sure about the flower power! Digging the beach bag and a big hells yeah to the flower power. Very cool. Will you keep us posted? Thanks! so cool! can’t wait to see them in stores or online! Love it, what a great mix of vintage inspiration and modern shape and fit. Plus those prints are amazing. And it’s produced in America, what a bonus. So cool shape and the prints, can’t wait ! Just the right amount of retro. Batten needs a website now! I would have bought swim trunks tonight. Maybe I will get another chance – keep us posted and remind everyone about Batten. Very Best Wishes to Batten Sportswear! Where can I get them at Tokyo. Rinatsukatao â€” the collection will be available next spring. 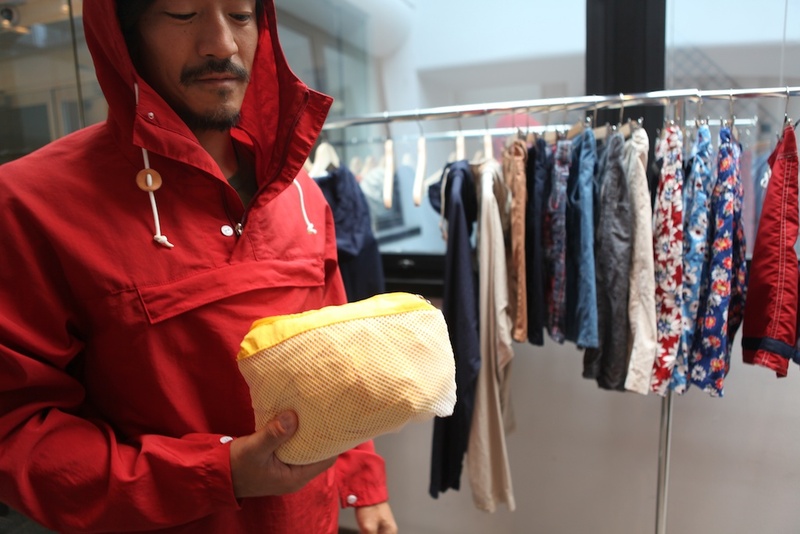 That red packable anorak is American sportswear perfection. 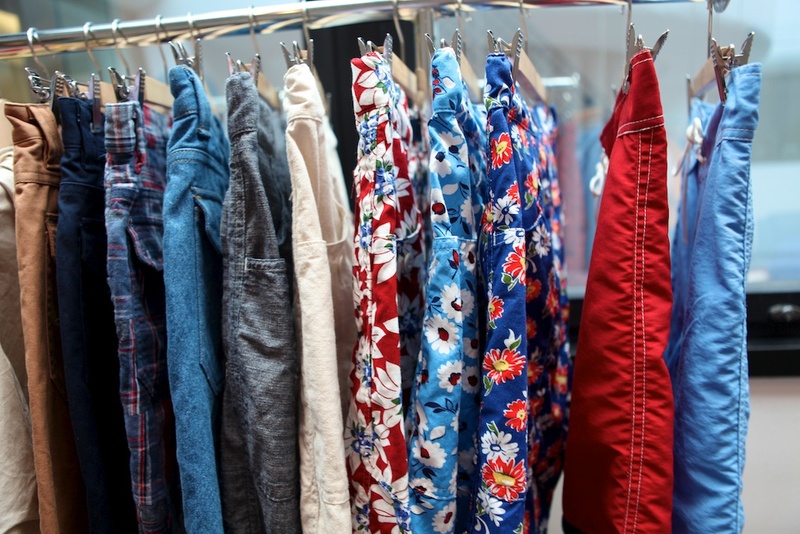 What are the price points on some of the items like the anorak, tee shirts, board shorts? I’m definitely ready to get that anorak–it’s just the one I’ve been looking for. I agree with previous posters that a website would be awesome right now. Wow. Definitely keep us updated on this stuff. Really interested to see some price points. Surprised to see the t’s as I scrolled down, those were really on point too. I love that duffle bag. My bigger concern about the line stems from the fact that it feels like I”ve seen it already. The shorts are definitely based on the Gramicci climbing short – a classic that is still manufactured today and the bathing suit is clearly an homage to the legendary Birdwell 303. 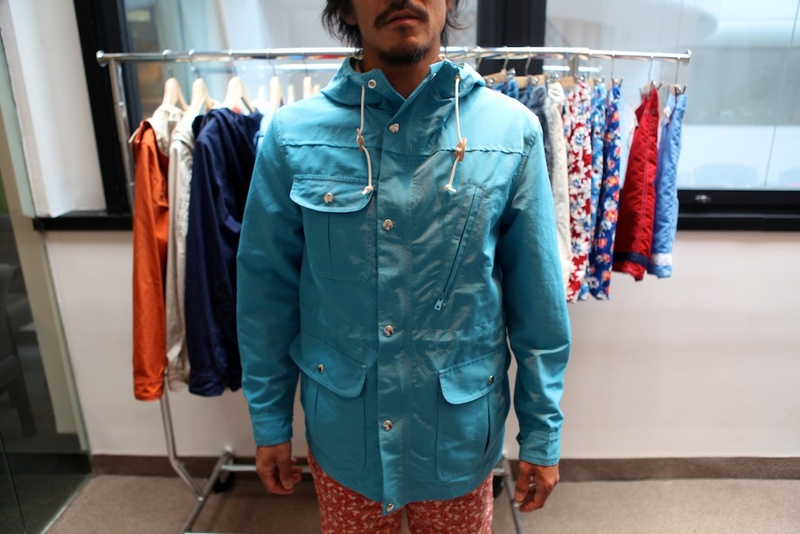 While the parka is a very serious nod to the Kelty anoraks/parkas of the same period. That said, He has picked the right places to start. It’s a good looking line of clothing, but more importantly I feel it looks as if he missed an opportunity to really differentiate his line from the originals. I’m very interested to see what happens next. @matthew langley Seems to me part of the differentiation is the cut. Sure there are similar anoraks out there, and the gramicci shorts are damn comfortable climbing shorts, but they’re frumpy looking. These cuts, as Michael mentioned, are slimmed up. @matthew langley – It seems like you have taken the very point of this collection, at least as described in this post, and declared it a fault. If each piece strongly reminds you of this-or-that piece, especially if that piece is a “classic” or “legendary”, isn’t that a success on Mr. Hasegawa’s part? @BillBurge – thanks for the reply. I get the difference on the cut – it’s noteworthy and important. However after that (to me anyway) is the style of the garment and the thinking behind it. In my opinion its as important as the cut and I think that’s where some of these pieces fall down for me. The cut is a good start, but to me it’s not enough a differentiator to give a ton of praise to – but understand I like the direction where this is going, I just think it had a couple of misses. I meant it when I say I look forward to his next line because the groundwork here is very strong – I probably should have been more obvious in that in my initial comment. I think that I’m not quite understanding what you mean – I think you are telling me that because Mr. Hasegawaâ€™s designs invoke (or seems a direct homage to) previous iconic designs that I believe it to be a downside of the collection. I don’t believe that – you may note that I mention that these are great starting points. I still believe that – but more importantly (to me) I want to see those starting points as a beginning not a final destination. I would really like to feel more of his presence in the final designs. Like I said – I love the duffel, and like most of the collection – and am very interested to see the continuation of his approach. Because that approach is a winner, but currently it is not without a few issues I’d like to see explored further. This is by far the most measured and respectful conversation that has ever appeared on ACL. Thanks guys. @matthew langley – You summed up my meaning accurately. I understand that you are interested to see, as you put it well, “his presence” in future works. Fair enough. On the other hand, there is something to be said for executing the classics well and I wouldn’t fault Mr. Hasegawa for dedicating himself further to this pursuit. We see on this site as much as anywhere how the “been done”, simple and utilitarian continues to rival newness for appeal among consumers. Freshest collection I have seen in a long time! I don’t wear a lot of prints, but I like them, and these actually look very wearable. I feel like McNairy would have designed this if he was a surfer/outdoorsman. WONDERFUL! I like it, especially the outerwear. Even the floral trunks look decent, though admittedly, if it came down to it, I would probably end up getting the striped trunks. 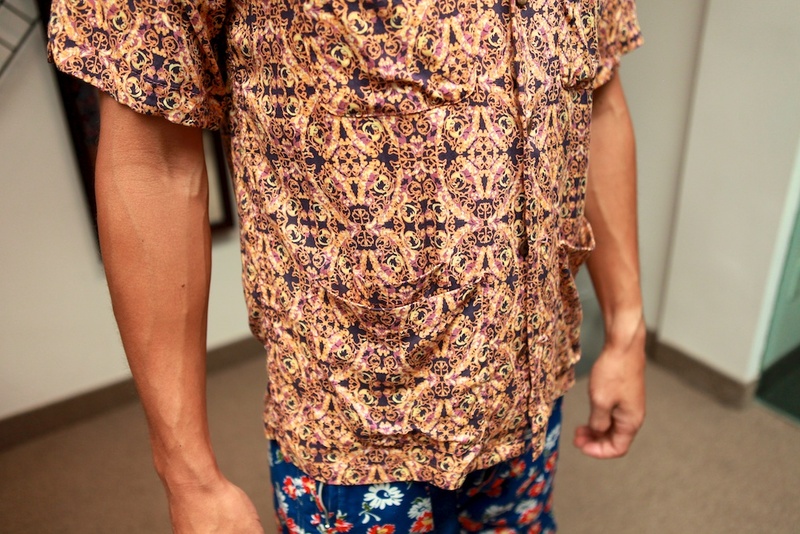 Love the prints. A bit of that funky 70’s look (color scale wise) but without the terrible bird wing collars. Approve! Where can we see these!? Very Nice! Love those parkas. I almost tossed my vintage 1973 REI 60/40 in the trash the other night but something made me stop, now I know – 70’s vintage sportswear returns. Glad I kept the parka – it goes with the Woolrich knickers and Galibier climbing boots I still hang on to from my college climbing bum days. Awesome stuff. Love the novelty of a slim, refined cut on the waterproof jacket. This reminds me of how much better the Brits did @ “White Blues” than the Americans. All this gear seems really unpretentious for how stylish it is. Funny — I’ve owned all those “originals” — Patagonia Stand-ups, Gramicci, Birdwells, 60/40 parka — and always wished they fit better. I’m down with anything related to Daiki, so this is definitely on my radar. Now if he can only get a spot in the Nepenthes store around the corner from my office…I do hope the price point will be around what EG or WWM is. Awesome. I am so stoked–and definitely hope it stays on the EG/WWM side of things rather than the silly “collector”-centric Visvim tip. Awe man, I was just thinking that the mid century and back retro thing is burning out and that a geeky 70’s vibe would be a nice thing to replace it and along comes this! love the patterns and the colors, very nice to see. Who cares if the line looks similar to someone else’s line of clothing. I’m happy they are made in the USA. I’ed buy them for that reason alone.